Hello everyone. I've been reading lots of your posts and decided to join so I don't feel so much like a peeper. I am new to this and am redoing a 55gal freshwater tank in my living room. I want to go with mostly plants and have never had a planted tank. I've been reading everything I can find and am starting to get overwhelmed. I want to take my time and try to get it right the first time, haha. Anyway I'll be absorbing all the info you want to send my way. So...I'm thanking you in advance. Welcome to AA. Our planted tank folks will be more than happy to help. A warning though, it is addictive. I know it can be overwhelming at first. If it seems too expensive, or too overwhelming, you can always go low tech at first and then expand on it later on. What I did with my first 55 was get a fixture that was 2x65 watt power compacts and I ran 50/50 bulbs in it which gave me a med-low light level so I didn't need CO2 and I was able to grow a variety of plants in regular gravel with root tabs and virtually no other ferts as my water is hard enough to take care of a lot of trace elements with water changes. I stuck mostly with crypts and stems and it worked well. Growth is also slower on lower light tanks so you don't have to trim as much. Definitely do your homework and have a plan, that is the best way to succeed but we are here to help so don't feel like you have to pioneer things. I would have never gone planted if it werent for all the resources I found here at AA. And I got plenty of advice from people in this wonderful community. Just wanted to say hi and welcome to the best aquarium site around - I wish you well with the plants - I'm getting back into aquariums after a 28 year absence and I know (at this point anyway) I not ready for planted tanks. But there are many people with some great planted tanks (check out the pictures forum) and they have a lot of information and techniques to share. Thank you for all the "welcomes". I've started aqcuiring what I think I'll need for my 55g planted tank. I got an Eheim ProII 2026 filter on Ebay the other day. I've had 2 nice pieces of driftwood soaking for about a week. I have the tank all cleaned up and sitting there waiting for a fresh start. I located a Coralife freshwater light,PC 2x65w, 6700 bulbs. I just wonder if I am going to be happy with just 130 watts or am I going to regret not going for more at first. The problem seems to be that the fixtures seem to jump to 4x65w, or 260 watts which seems like too much. I will have CO2 injected I just don't know which direction to go with the lights. Any suggestions?? For starting out I think you made a great choice. That amount of light will give you a lot of options for different plants, and be less maintenance than a higher light system. As Zagz stated, however, it's addictive, and in the long run you'll end up with a high-tech setup. You said you located a light, but did you already get it? The reason I ask is that if you foresee yourself going high tech later in, it might be a cost savings to get the 4x65 now, and only run 2 bulbs for the time being until you're ready for the jump up. Those fixtures come with multiple switches, so you would be able to only run 1/2 of the 4x65 fixture and get the same results as you would with the 2x fixture, but have the extra horsepower onhand and ready for when you want to step up some in light. Just my opinion here. I think that 2x 65w for a 55 gal is plenty. Especially with PC bulbs which are 1.7 times the effective wattage of a normal output florescent bulb. 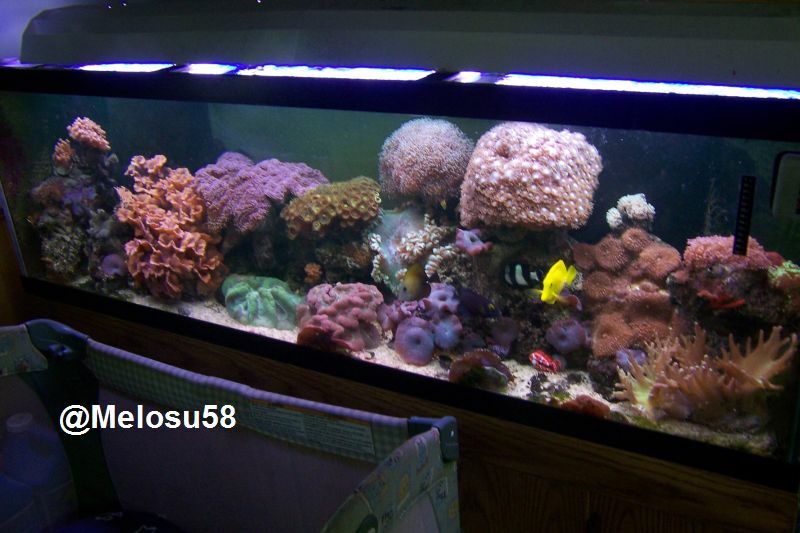 I would only get a larger fixture if you plan to one day upgrade to say a 75 or 90 gal tank and dont want to have to buy another light fixture.